Sometimes it's fun to get all fancied up. Sometimes I like wearing Sequins and Tulle and Glittering Earrings at the same time. Sometimes you just need to rock a high pony. Sometimes a girl just needs a night on the town. Sometimes I absolutely love being a woman. Wearing this outfit is one of those times. For me it doesn't get much better than this! GORGEOUS!!!! What a WOW look. I love the little detail of the blue polish too. Well this is just fabulous! I agree, sometimes you just need to get dressed up! A girl needs to get fancy every once in awhile. This look is incredibly gorgeous!! Just love that top!!! I sooo love the tulle skirts! Gorgeous look! this outfit is PERFECT!!! i am obsessed! Oh my goodness! That top is just amazing! I am seriously in love with this whole outfit! You look gorgeous! I love this look! Your top is amazing!! I love this look on you, reminds me of a ballerina, so delicate and yet fancy! So cute! Sadly I don't go anywhere to wear this fab outfit but I love seeing it on you. You look beautiful. I love your skirt, it goes well with your sequins top! Absolutely loving your skirt!!! This is such a stunning look! This outfit is everything! You look stunning! I'm just a tad bit obsessed with this entire outfit! You look gorgeous! You look amazing! Love that tulle skirt. Dressing up is so much fun! Oh my gosh! You look like a real disney princess from the cover of the magazine! Gorgeous, stunning and very beautiful! Have no words to describe awesomeness (lol:)) of this dress! This outfit is so pretty! I love that skirt! You look amazing!! My computer access was funky while I was away but was dyingggg to comment on this post! 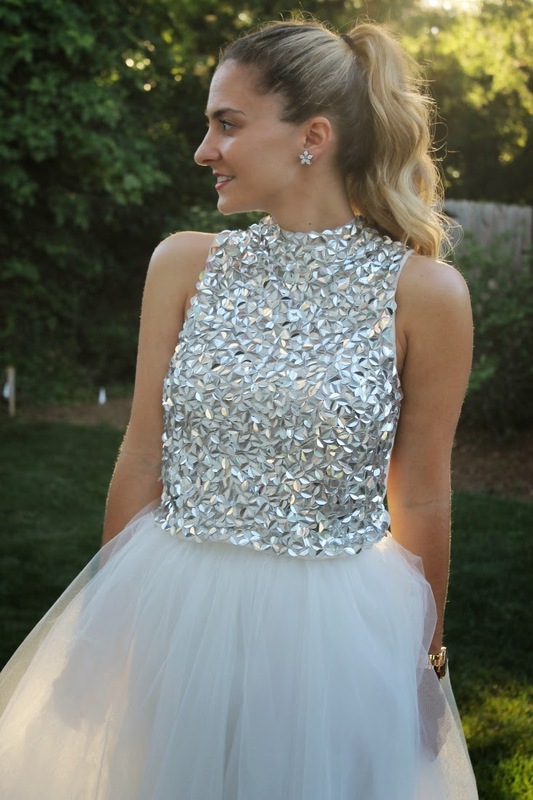 The combo of sequins and tulle is perfection and one of my favorites!! Hi! stopping by from the linkup. What a fabulous outfit! Absolutely loved how you paired it with the sequins, gorgeous! Stopping by from the link-up... ahh! Gorgeous from head to toe. I love how feminine and glitzy this is... I would wear in a heartbeat!